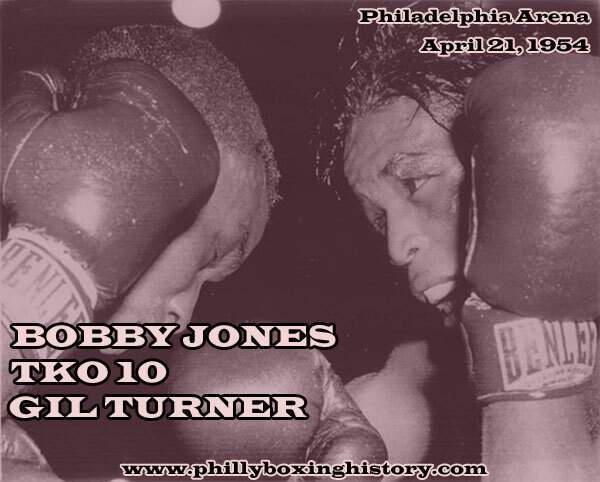 On this day in 1954, Bobby Jones, the California middleweight who defeated Gil Turner by ten round decision one month before, repeated the feat and went one better by scoring a last minute TKO over the Philly battler. The KO loss was only the second time Gil couldn't finish a fight, the first being his glorious title try against Kid Gavilan in 1952. The rematch between Jones and Tuner was a close fight up to the time of the stoppage. In a curious note, the free swinging whirlwind style that made Gil Turner such a fan favorite (and effective competitor) was put on the shelf for this fight in favor of a laid back counter-punching strategy. It wasn't the best plan. Throughout the bout, Gil laid back on the ropes and waited for openings. This must have been a sight to see and probably had fans wondering if they were really watching Turner. The end of the fight came suddenly in round ten when Jones nailed Turner with a rocket right hand. Turner staggered back against the ropes and Jones fired away with a volley of punches until referee Zack Clayton jumped in to stop it. The loss dropped Turner's record to 42-6 with 29 KOs and finally made him rethink his move up to the middleweight division. Before long, he would be back fighting at a more comfortable 147 pounds.